Under Sink Reverse Osmosis Kit for Water Coolers, an undersink RO system compatible with FilterWater and G- Bottleless Water Coolers. A separate add-on for floor and countertop class coolers that removes final impurities from water and is great for applications where pure water is essential. 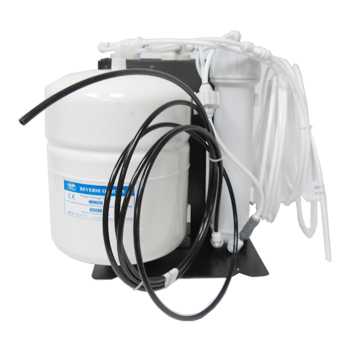 This RO kit can be used as an add-on to existing coolers without filtration or an upgrade to a reverse osmosis system. This under sink kit is compact and space saving. Install under the sink or inside a cabinet, away from view. Selected high quality components, US-made where possible. Upgrade with confidence! Reverse Osmosis System assembly unit(on a frame). Optional countertop faucet (available in chrome or brushed nickel). * Use standard 1/4" OD (outside diameter), "plastic tube" water line to connect these inside your cooler and to a drain. Optional component: 4 gallon NSF certified tank(3.2 actual gallons). Q: How do I know if I need a 4 gallon storage tank? A: Some floor size water coolers already have a built-in tank for the RO systems. In this case, you can use the built-in tank. If your cooler doesn't have one, or if the unit is small, or cooler is a countertop type, we strongly suggest ordering this kit with the RO tank.